Electric fencing faces a few extra hurdles during the winter. Frozen ground, the insulating qualities of snow and ice, sub-zero temperatures, and the mud seasons that bracket the winter in fall and spring all pose their own challenges to your electric cattle fences. While each of these challenges are easily overcome, it does take a little extra planning and attention to detail to keep your electric cattle fence grid functioning effectively through the depths of winter. This article - the last one in the seven part Smart Electric Fence Grid series - is about all those little details that will keep both your permanent and portable electric fences functioning effectively right through the winter season. Electric fences (whether they are solar-powered or powered by a plug-in fence charger) all rely on a simple principle - when the cow touches the electrical wire, her body completes the electrical circuit that allows electricity in the fence to 'flow' down through the ground. The earth-ground system back at the electric fence charger then draws electrons back up from the soil to replace the electrons that escaped from the fence when the cow touched the fence. This simple principle is summarized by the red arrows in the image below. 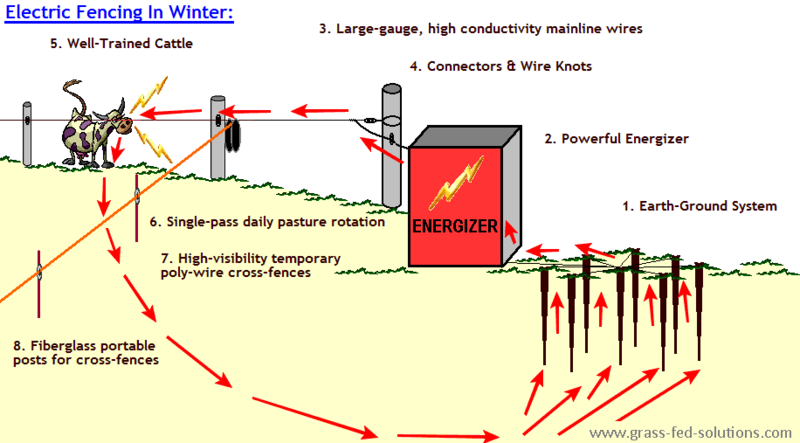 Getting a good 'zap' from your electric cattle fences during the winter depends on how easily electrons can flow from the wire through the cow to the ground and how easily the electric fence charger can draw electrons back out of the ground to replace the electrons that escaped the wire when the cow touched the wire. There are quite a few vulnerable areas where this circuit can get interrupted when there is snow on the ground and the ground is frozen - on this page I will address each of these vulnerabilities and then explain how to winterize them so your electric fences can continue working in top form. I will also address several key management factors to remember when operating your electric fence grid during the winter months so that your winter pasture rotation can continue without missing a beat. Fibreglass temporary portable posts hammered or drilled into the ground. Locate ground rods in an area of undisturbed snow, preferably sheltered by trees or on the leeward side of a building, to minimize frost penetration around the ground rods. Ensure that the area around your ground rods is moist before the onset of winter. Dry winter air and a lack of new precipitation penetrating the soil can cause soil moisture around the ground rods to decrease sufficiently to lose good conductivity where the soil and the ground rods contact one another. Use multiple ground rods spaced at least 10 feet apart. Each ground rod should be at least 6 to 8 feet in length. They must extend well below the deepest level of frost penetration. Rather than laying out ground rods in series, use the 'crow's foot design' shown on page 70 of Grass-Fed Cattle, which ensures the best earth-ground conductivity. Page 69 of the same book also explains how to calculate many ground rods you will need per joule of stored energy in your fence energizer (a JOULE is a measure of power produced by your electric fence energizer). Use good quality clamps and high-conductivity, large-diameter, insulated (coated) leadout wire to connect the ground rods to the fence energizer. While grounding your electric fence charger is crucial, it is also important that your fence energizer or solar fence charger is sized correctly. A good rule of thumb is 1 Joule / 6 miles of wire. Picking an energizer with a minimum 10 Joule rating also ensures that the fence charger is capable of killing any vegetation that grows up underneath your fence wires during the growing season. This helps eliminate unnecessary power drains as your pasture rotation extends into the winter season. Under-powered electric fence energizers will struggle to push sufficient power down your fence lines during winter when soil conductivity around your ground rods and beneath your cattle's feet decreases. Use your volt meter to test that your current fence charger is capable of maintaining at least 3500 volts on your fences even at the furthest extent of your electric fence grid; preferably more so that your temporary portable electric cross-fences will also have sufficient power when they are connected. Ensure that your mainline electric fence wires (the fence corridors described in Part I of this Smart Electric Fence Grid series) are all constructed using heavy gauge galvanized wire (12.5 gauge) to ensure maximum electrical conductivity in the wire. (The thinner the wire, the higher its electrical resistance). With frozen ground already affecting the grounding of your fencing system, you need to make sure that your main lines can transport as much voltage as possible throughout the entire electric fence grid without sacrificing unnecessary voltage to the high resistivity of small-gauge wires. For extra long stretches of wire, consider upgrading to an aluminum wire for your permanent electric fence grid because it has considerably higher electrical conductivity than galvanized wire. In a worst-case scenario, if you simply cannot keep a good charge on your fences during the winter, you may need to add a second, lower ground wire mounted approximately 10 inches below the 'live' wire. This ground wire (un-powered - no insulators required) is connected directly back to the electric fence charger so that cattle will get shocked if they come in contact with both ground wire and live wire simultaneously. However, using two wires instead of a single-wire per fence triggers a huge number of unnecessary extra management complications, including accidental shorts between the two wires, reduced flexibility in your electric fence grid (it's not practical to lift two wires to create temporary gates), and more vegetation shorting out the live wire because the ground wire impedes cattle grazing under the wires to keep grass growth in check during the growing season. Before considering adding a ground wire, work through each and every other point on this list to boost the conductivity and effectiveness of your electric cattle fencing system. Do everything you can to avoid adding a ground wire to your electric fence grid! I have successfully used single-wire fences without ground wires in Northern Canada in exceptionally dry conditions and cold temperatures (down to -54°C (-65°F) and with frost penetrating more than 6 feet into the soil), so if you are experiencing troubles with wire conductivity in winter, chances are very good that you can solve your issues through one of the other points discussed in this article without having to resort to a ground wire. Cold weather causes your electric fence wires to contract, which increases the tension on the wire - often sufficiently to start pulling brace posts out of the ground. This is particularly problematic as the frost comes out of the ground in the spring. Remember, an electric cattle fence is merely a psychological fence, not a physical barrier. Even though the wire used to build your electric fence grid is called "high-tensile" wire, your fence grid should not be a 'high-tension' fence. Your wires only need to be pulled tight enough to keep them at the right distance off the ground (approximately 30-34 inches). Extra give in the wire makes it easier to prop up wires to create temporary gates, makes the wire less prone to breaking if it is tested by cattle or if wildlife runs into it, and less tension means you can build simpler and cheaper brace posts that won't be pulled over during the winter as wires contract (brace posts are discussed in detail on page 74 of Grass-Fed Cattle). Every time you join two wires, the connection point becomes a potential problematic point of high electrical resistivity, akin to creating a kink in a garden hose that restricts flow. Hastily-tied or improperly-tied wire knots with only a single point of contact are guaranteed high-resistance problem areas, but in reality ANY wire splice, wire knot, joint, or new fence connection that is built without adding proper joint clamps to join wires will seriously affect wire conductivity. Each new knot, join, or splice adds up, restricting electrical conductivity further with each new join along the line. Before winter begins, check all your fences and add connector clamps to all your hasty emergency fence repairs that occurred over the summer. While you may not notice a significant drop in voltage during the growing season, the high resistivity of poor wire joins will cause a considerable drop in voltage at the far ends of your electric cattle fence system in the winter when earth grounding systems are already struggling to function with frost in the ground. Learn to tie proper wire knots like the reef knot and the figure eight knot, which ensure maximum wire contact across the join. And make sure that ALL new fence connections, knots, and wire joins are reinforced with connector clamps (also called joint clamps) to ensure good electrical contact between the two sides of the electrical connection. To learn how to tie wire knots by hand using 12.5 gauge high-tensile electric wire (without needing special fencing tools! ), refer to the 2-page insert and diagrams on page 72 and 73 of Grass-fed Cattle, or contact your local electric fence dealer to arrange a fence construction and wire knot tying clinic. A correctly-tied reef knot ensures maximum contact between the two sides of the broken fencing wire. This wire knot is very easy to tie by hand using stiff high-tensile 12.5 gauge galvanized wire. You do not require any special equipment to tie wire knots or to break off the wire ends - just your hands and the techniques described in Grass-Fed Cattle. The insulated wire that is buried under gates (commonly known as insulated leadout wire) is a common source of electric shorts because the insulated coating is easily damaged or cracked (especially during cold weather when it becomes brittle). Even the smallest crack creates an electrical short between the 'hot' wire and the soil. Furthermore, as the soil gets muddy in fall or spring, vehicle traffic can cause deep ruts through gates which impact the wire buried below. Kinks or heavy stretching can crack the insulated wire coating, or even break the entire wire. Buried coated wires also seem to attract mice and voles during the winter, which will gnaw off the insulated coating. To protect buried wires, slide the insulated (coated) wire through a section of garden hose that is cut to fit the entire length of the buried wire. Bury the wire / garden-hose-combo together. This combination will help protect against rodent gnawing and will protect against small changes to the soil profile caused by frost heaving or shallow ruts caused by traffic during the mud season. When burying wire under gates that experience heavy traffic and deep ruts, bury a steel pipe under the gate (2"-diameter pipe is cheap and strong enough for this purpose) and then slide the insulated wire / garden-hose-combo through the steel pipe. In a worst-case scenario, remove the buried wire altogether and create an overhead wire instead by nailing a long board to either side of the gate post (extending the post height) so you can permanently hang a short section of 'hot' wire high overhead, allowing cattle and vehicles to pass underneath. Tie a few bright ribbons to the overhead wire so you don't catch it with a raised tractor bucket or while riding a horse through the gate. 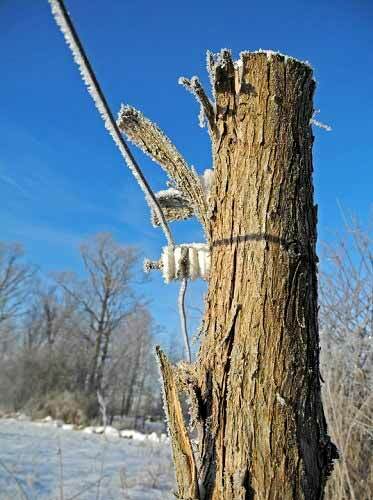 Winterize your electric fence grid just before the onset of winter. 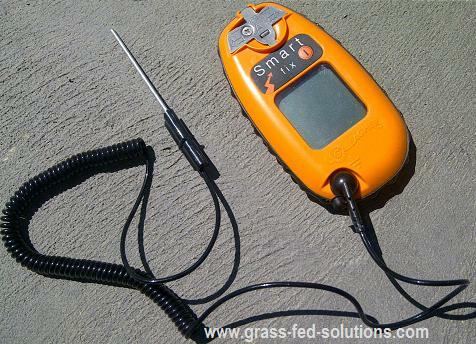 That means grabbing your volt meter/current meter/fault finder, such as the SmartFix fault-finder from Gallagher Animal Management Systems shown in the image below, and heading out to test all your fences. A good fault finder should show more than whether the fence is ON or OFF, it should measure current, voltage, and give you an indication of which direction you need to go along the fence to find the problem area. As you check your fences ahead of winter, remove all dead grass and vegetation from your fences so they don't put extra strain on your fence charger during the winter. Repair broken wires and add joint clamps to all joints and wire knots to ensure good connections. The SmartFix electric fencing digital volt meter, current meter, and fault finder. Snow and ice are insulators that interfere with the electrical connection between your cattle and the soil, similar to touching an electric fence while wearing rubber boots. Your cattle's thick winter hair coat also is a terrific insulator that reduces the electric shock they experience when they come in contact with your electric cattle fences. Cattle trained to electric fences fear those angry little wires and are loathe to go anywhere near them. It is not uncommon for cattle to completely fail to notice that a fence has lost all power because of a wire break elsewhere along the line (outside of the pasture). They fear it and won't touch it any more than you would voluntarily touch it, and so the lack of power goes unnoticed. On one occasion I had a section of fence that lost power for over a month without the cattle (or me) noticing! If cattle have been well-trained to respect electric cattle fences long before winter starts, they are unlikely to notice if the bite of the electric wire is reduced during the winter. Even a half-hearted 'zap' will generally serve to quickly remind your cattle of their training. Only prolonged contact, such as if your pasture slices are too small so that your cattle can't find enough feed in their current pasture (causing them to graze ever further under the wire) will alert them to the fact the wire has less bite than they remembered. So make sure that your cattle are trained to electric fencing before they are turned out onto their winter pastures! Click on the link to learn how to train cattle to electric cattle fencing. Single-pass grazing using daily pasture rotations is extremely important during winter grazing to reduce pressure on fences and improve contact with the frozen soil. A daily routine of fresh access to a new, untouched slice of pasture means less pressure on fences because the cattle get fresh high-quality nutrition from their fresh pasture slices every day. This gives your cattle less reason to test your fences. Rotational grazing that uses daily pasture moves also makes it much easier to size pasture slices correctly. You can learn more about intensive grazing strategies for your winter pasture rotation by following the link. When each new day's grazing begins with a pasture covered by undisturbed snow, the cattle's hooves have maximum contact with the frozen soil beneath their feet. Thick compacted snow layers or ice only begin to affect contact between the cow's hooves and the soil after the snow has been compacted by cattle hooves through prolonged exposure. Daily pasture rotations that never return twice to the same winter pasture ensure that the snow covering the soil is as loose as possible so that cattle hooves have maximum contact with the soil. By the time the snow has been churned through and begins to re-crystallize sufficiently to support the weight of the cattle, the herd is ready to move on to the next day's grazing slice. Solar powered electric fence energizers need just a little extra care to continue to work effectively during the winter. In winter the sun is significantly lower on the horizon. This means that you should change the angle of your solar panels so that the sun continues to hit the panels at a 90° angle to maximize solar photovoltaic charging of the battery. Shorter daylight hours in winter mean that the solar panels on your solar powered fences may not be able to keep up with demand. The battery won't fully recharge each day and will slowly deplete over time. Many solar electric fence chargers have a power-saver option that allows you to run your energizer at half-power to reduce battery draw-down. Use your voltmeter / fault finder to ensure that half-power still provides at least 3500 volts along your entire fence. Always use deep cycle marine batteries with your solar powered electric fence charger because these batteries are built to withstand deep draw-down. Regular car batteries will fail during repeated heavy battery draw-downs. Always keep a spare battery on hand for your solar powered fence charger so you can swap batteries, allowing you to fully recharge each battery from time to time with a plug-in battery charger back at the farmyard. At 49° North latitude, switching batteries once per week to fully recharge the second battery is usually sufficient to prevent the voltage from dropping below 3500 volts on the fence. If you live further north, you will require more frequent battery swaps. Further south will require less. Cloudy weather will also increase the frequency of battery swaps. And, finally, make it a habit to sweep snow off the solar panels every day during pasture moves to keep the solar panels working effectively. Portable electric cattle fence wires are made of a braid of multiple thin wires. These thin wires have a much higher electrical resistance, which is why voltage in portable electric fences drops very quickly over short distances. In Part I of this article series, I explained that the permanent fence corridors, built with 12.5 gauge high-tensile wire, should be spaced no wider than a single portable electric wire spool apart to ensure sufficient voltage along the entire length of each portable electric cross-fence. Part II explained that each portable cross-fence should be powered by attaching an alligator clamp to one end of the cross-fence between the poly-wire and the mainline. If your fences are suffering from a drop in voltage during winter, add a second alligator clamp to the other end of the portable cross-fence (or replace insulated plastic-tipped handles with metal-hooked handles that will conduct electricity when connected to the electric mainline fence corridors) so that the cross-fences are powered from both sides instead of only from one end. It is also useful to use a low-resistivity poly-wire during the winter. For example, Gallagher Animal Management Systems makes a "Turbo Tape" with a resistivity of only 209 Ohms/mile, which is 40x more conductive than their standard poly-wire, which has a resistivity of 10,000 Ohms/mile. The low resistivity poly-wire alternative ensures that you maximize the voltage available through the full length of your portable fence subdivisions during the winter months. During winter, use braided poly-wire for all your portable electric cross-fences rather than the flat, wide poly-tape because the thin profile of poly-wire collects less snow. This prevents the wire from being weighed down and buried during a snowstorm. Polytape is notorious for getting flattened during snowstorms. Orange is the best color for your portable temporary fences because it is a contrasting color against white snow. White poly-wire fences tend to be invisible against a backdrop of snow and will be broken by cattle, wildlife, or human traffic that fail to see the wire. Fiber-glass posts hammered into the ground. Pasture soils with a thick sod mat have a sponge-like texture, even when frozen, as long as they have not-yet been disturbed by your winter pasture rotation. Since your new cross-fences will always be put up ahead of your grazing herd in undisturbed pastures, fibreglass posts can usually be hammered sufficiently far into this sponge-like frozen soil texture to remain upright. As soils become firmer, you won't need your posts to penetrate the soil more than an inch or two to remain upright, particularly since the posts are also being partially suspended by the tension of the portable poly-wire strung between to parallel permanent electric fence corridors. Always use a small driver cap (such as a 6" long slice of broom handle with a small hole drilled half-way through from one end) to protect the fibreglass posts from fraying while hammering them into the ground. Fiber-glass posts drilled into the ground. Some soils, especially those with high moisture content, will freeze too solid to allow you to hammer in a fibreglass post. And once a pasture has been disturbed by grazing cattle, even the most sponge-like soil texture typically becomes impenetrable because the traffic drives the frost deeper into the ground, causing ice crystals to form in the voids in the soil and compressing the air spaces in the frozen sod mat. Carry a cordless drill with a long 1/2" diameter drill bit to drill short holes into the soil to hold your round fibreglass posts. Just a few inches depth will easily support a fibreglass post in firmly-frozen soils. Tumblewheel posts. Another alternative is to use 'tumblewheel posts', which are star-shaped posts designed to stand on top of the soil surface. The wire passes thorough a perpendicular tube (axle) fixed at the center hub of the tumblewheel. These posts are typically used in summer to allow you to 'free-wheel' your cross-fence ahead to a new position, but they also work well in winter on frozen ground. Tumblewheel posts only work for straight cross-fences as they rely on the wire tension on both ends of the cross-fence to keep the posts upright. Posts in buckets of sand or frozen water: Another alternative for a free-standing portable electric fence post for your winter pasture rotation is to stand/freeze fibreglass posts inside a moveable bucket filled with sand or frozen water. While a little tedious to move because of their weight, they are useful for creating temporary alleys or fencing off large sections of previously-grazed pastures where the post won't need to be moved again for a while. As you can see from this article, the challenges that winter throws at your electric fencing system are remarkably easy to overcome with just a little extra planning and a little extra attention to detail. 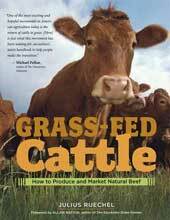 You can find more information about how to set up your rotational grazing program in my book Grass-Fed Cattle. Part V - integrating cattle water into your smart electric fence grid. Part VII - electric fencing and cattle water in winter. Training cattle to electric cattle fences - create effective psychological barriers in the minds of your cattle. Raising Beef Cattle on Grass - Learn how to prepare your cattle herd for your grazing conditions. Training Cattle for Winter Grazing - How to train cattle to graze through deep snow. Preparing Pastures for Winter Grazing - (Grazing Rule # 6) Learn how to create the perfect winter pastures to extend your grazing season long after the growing season ends. Winter Grazing Strategies - (Grazing Rule # 7) How to manage your cattle grazing program after the growing season ends.